Debunkers of the unexplained insist that human testimony is inherently unreliable. In addition to their relentless dishonesty, members of the general public suffer from wishful thinking and overactive imaginations. Interview 10 witnesses to the same event, and you'll hear 10 wildly disparate and contradictory accounts. Objective facts tell the truth, but people can only be trusted to lie. But this assertion of self-styled skeptics is apparently a one-way street. While these folks relentlessly reject A PRIORI all testimony that conflicts with their worldviews, they do not hesitate to endorse all anecdotal claims that purportedly debunk the "paranormal." Take, for instance, the reaction of the "skeptical" community (and their cohorts in the elite news media) to Greg Long's recent book, "The Making of Bigfoot: The Inside Story." Long claims to have solved the mystery of the Patterson film -- that famous (or infamous) footage from 1967 of a large, upright walking, hairy beast. A 63-year old man named Bob Hieronimus says that he was the "star" of the film, and the original Bigfoot "costume" was traced by Long to a man named Phillip Morris, who has "confessed" to his role in the purported hoax. The evidence presented by Long (which includes the testimony of many others, as well as legal documents signed by Patterson) has been more than enough for most members of the media to declare "case closed!" not only on the Patterson film, but the entire Bigfoot mystery. On October 7, 2004, the Yakima Herald-Republic published an article with the bold title, "Bigfoot Hoax Goes in Halls of Hooey." Journalist Leah Beth Ward makes numerous statements which seem to endorse Hieronimus and Morris as truthful. She writes, "The Yakima man who made history and legend 37 years ago by walking in Bigfoot's flat feet donned the costume again this week to put the hoax firmly in the halls of hooey." Ward continues, "Patterson, see, was a prankster who thought he could make a million dollars by distributing the Bigfoot film nationally. Enough audiences saw the image of the hairy primate that it became an object of mythic proportions for some and gargantuan sarcasm for others." This statement seems to imply that the Bigfoot phenomenon did not exist prior to the Patterson film, but was a "myth" born of media sensationalism. This is patently false, and I will demonstrate this as I continue. Ward concludes her report by asking, "Will all this truth-telling spell the end of Bigfoot?" I'm not sure what psychic ability Ward possesses that enables her to categorically label these Bigfoot "confessions" as "truth-telling." I'm curious as to how this reporter would react if I told her I was the little green man in Ray Santili's Alien Autopsy video. I could parade around in a rubber alien suit from my local costume outlet, and the next day's headline would read, "ET Sent Home! Existence of Aliens Disproved!" Let me make it clear that my goal here is neither to attack the investigation of Greg Long, nor to defend the deceased Roger Patterson. But I've always been leary of skeptics who try to limit Bigfoot discussions to this one controversy. Generally, people who characterize the film as the "best evidence" of Bigfoot are debunkers with no real breadth of knowledge of the issue. Everyone knows that film and video evidence can be faked, and it is certainly possible, perhaps even likely, that Long's investigation has revealed the truth. That is why evidence like the Patterson film can never provide more than one small piece of a very large puzzle. Before we completely write off Bigfoot as a product of modern hysteria and wishful thinking, we should remember the enormous body of data, some anecdotal and some physical, that has been accumulated on the alleged creature over many decades. Unbeknownst to most, people have been seeing Bigfoot-like creatures since long before the Patterson film. One of the earliest published accounts of a possible Bigfoot was found by cryptozoologist Loren Coleman, in a newspaper report from the mid-19th century. From the May 9th, 1851 edition of the Memphis Enquirer: "During March last, Mr. Hamilton of Greene county, Arkansas, while out hunting with an acquaintance, observed a drove of cattle in a state of apparent alarm, evidently pursued by some dreaded enemy. Halting for the purpose, they soon discovered as the animals fled by them, that they were followed by an animal bearing the unmistakable likeness of humanity. He was of gigantic stature, the body being covered with hair and the head with long locks that fairly enveloped his neck and shoulders. The 'wildman', for we must so call him, after looking at them deliberately for a short time, turned and ran away with great speed, leaping from twelve to fourteen feet at a time. His foot prints measured thirteen inches each. This remarkable report describes eyewitness accounts of a "wild-man" dating back to the 1830's. The author of this piece even describes the existence of the animal as "beyond cavil," or beyond doubt. Remember, this was reported more than a hundred years before the Patterson film, and the alleged birth of the modern Bigfoot "myth." Bigfoot characteristics described in this early account are found consistently in the most recent sightings. I've interviewed a number of Bigfoot eyewitnesses, including paranormal investigator Jason Valenti. Valenti was driving with a business partner on a road bordering Appalachicola state park in Florida, when he spotted an "animal" standing nearly seven feet tall, with a face something like a "chimp and a pit-bull's," female, and possessing pendulous breasts. 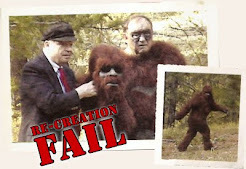 Like the creature described in the Arkansas account, this Bigfoot reportedly had the ability to leap enormous distances. Valenti writes, "(The passenger in the car) told me that a few seconds after we passed her, as he was looking back through the window, he witnessed her leaping from a standing position apprxoimately 20 to 30 feet horizontal, 10 to 15 feet vertical and then landing into a full blown sprint through the sand pine forest." Like many others who claim to have encountered Bigfoot face to face, Valenti says that his entire belief system was "completely shattered" as the result of his experience. Also fascinating are the many accounts of the Yeti (or Abominable Snowman) from around the globe, particularly in the Himalayas. The most compelling Yeti encounter I have ever come across was written by Slavomir Rawicz in his critically acclaimed biography, The Long Walk. Rawicz conveys the harrowing tale of his escape from a Soviet labor camp in Siberia in 1941, and subsequent 2 year journey through China, the Gobi Desert, Tibet, and over the Himalayas to British India. It was in the Himalayas that Rawicz and his companions encountered a "family" of alleged Yetis. Rawicz described the "Yetis" as over seven feet in height, and covered with fur similar to that of apes in the orange-outang species. He writes of his and his fellow travelers' futile struggle to rationalize the creatures' bizarre appearance: "We decided unanimously that we were examining a type of creature of which we had no previous experience in the wild, in zoos or literature. It would have been easy to have seen them waddle off at a distance and dismissed them as either big bear or big ape of the orange-outang species. At close range they defied description. There was something both of the bear and the ape about their general shape but they could not be mistaken for either." The path of Rawicz and his companions was blocked by the "Yetis," so they (the humans) observed the creatures for one hour, even throwing rocks at the beasts in an attempt to frighten them off. The "Yetis" did not seem to mind. One gentleman remarked, "It occurs to me they might take it into their heads to come up and investigate us. It is obvious they are not afraid of us. I think we had better go while we are safe." Rawicz sums up his tale, writing: "What were they? For years they remained a mystery to me, but since recently I have read of scientific expeditions to discover the Abominable Snowman of the Himalayas and studied descriptions of the creature given by native hillmen, I believe that the five of us that day may have met two of the animals.."
This account is terribly fascinating because of the tremendous sincerity and credibility of Rawicz' entire tale, but also because of the off-hand, almost incidental manner in which the author shared his experience. The Long Walk was praised by the Los Angeles Times as "a book filled with the spirit of human dignity and the courage of men seeking freedom," and the Chicago Tribune called it "One of the most amazing, heroic stories of this or any other time." Of course, skeptics contend that eyewitness accounts of Bigfoot and other unusual phenomena are meaningless without corroborative physical proof. What, if any, physical evidence is there of Bigfoot's existence? A number of alleged "Bigfootprints" have been subjected to analysis over the years, with mixed results. One person to conduct such analysis was police fingerprint technician Jimmy Chilcutt, a bona fide skeptic who purportedly sought to debunk so-called Bigfoot plaster castings. In 1995, Chilcutt began the novel task of analyzing the prints of primates to "find primordial characteristics that would unlock hidden information in human fingerprints." (Source: thehoustonchronicle.com) By 1998, he had amassed over 1,000 primate prints, and was one of only four or five researchers in the world studying the prints of animals. Chilcutt states that he has discovered characteristics which enable him to distinsguish between species, and locate different traits within species. In December of 1998, Chilcutt contacted Bigfoot researcher Jeff Meldren, associate professor of anatomy at Idaho State University. Meldren has a collection of over one hundred alleged Bigfoot plaster castings, and Chilcutt was given free roam to analyze each casting. Chilcutt had this to say about his conclusions: "What I actually found surprised even me." "The print ridges on the bottoms of five castings -- which were taken at different times and locations -- flowed lengthwise along the foot, unlike human prints, which flow from side to side," he said. "'No way do human footprints do that -- never, ever. "The skeptic in me had to believe that (all of the prints were from) the same species of animal," Chilcutt said. "I believe that this is an animal in the Pacific Northwest that we have never documented.'" (END EXCERPT). Interestingly, I attempted a word search of "Jimmy Chilcutt" on numerous skeptical websites, including csicop.org, and randi.org, and could not find any matches. Have these people even HEARD of Chilcutt's research? 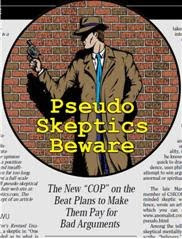 This appears to be in keeping with the standard practice of so-called skeptics who habitually IGNORE and/or BURY evidence which does not fit with their a priori assumptions. 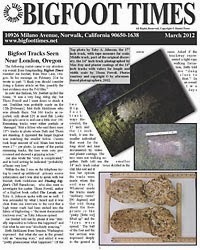 It is obvious that the Bigfoot mystery is a great deal more complex than most of the media would have us believe. Irrespective of the Patterson controversy, we have more than enough data to warrant further investigation by mainstream science. We must also remember that it is erroneous to label Bigfoot as a "paranormal" phenomenon. Science is discovering new species of animals all the time, including exotic primates - nothing paranormal about that. As recently as 2003, a new "mystery ape" was discovered in the heart of Africa which is said to have characteristics of both the gorilla and the chimpanzee. The as-yet-to-be classified ape is also said to have feet over 14 inches long, more than 2 inches longer than a typical gorilla's. Most unusually, it was discovered thousands of miles from the nearest documented ape habitat. One primatologist who examined the beasts at an Omaha zoo said, "I can't speculate yet as to what they are. Their behavior is so unusual. It's a puzzle....The possibility is there that this is a new species due to isolation....I feel like Dr. Doolittle in the land of Oz." One can only hope that the world's skeptics will learn to leave the door open to life's mysteries a bit longer. From Dr. Jeff Meldrum's Sasquatch Field Guide: While there have been no credible reports of unprovoked attacks on humans sasquatch are nevertheless large and very powerful creatures demonstrating feats of considerable strength and should be accorded the same caution as a bear or any other potentially dangerous wild animal. A journal providing "scholarly peer-reviewed papers exploring and evaluating the possible existence and nature of relict hominoid species around the world." 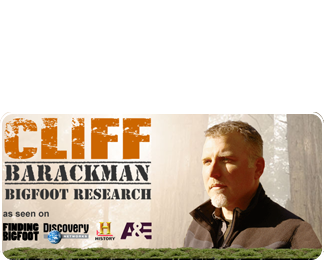 The most penetrating search for Sasquatch/North American Ape ever conducted in North America. Why isn't there more footage of a sasquatch?